Laser Leisure is a rather interesting game for your Windows Phone. The game is challenging, yet mildly frustrating. Game play is simple but requires well thought out strategy. I'm still not sure if I like Laser Leisure. There were a few glitches along the way and some of the levels are down right frustrating. However, if you like puzzle and logic type games, it's worth a try (glitches and all). Laser Leisure calls upon you to hit targets with your laser using a series of mirrors to reflect and turn the laser beam. Laser Leisure is a thirty level game that progressively gets more challenging across three skills levels (novice, advanced, and expert). The game's main menu presents options to play the game, access the game's options, read the instructions, view the high scores, and view the info/about screen. Laser Leisure has two game modes, Ladder and Freestyle. Ladder is the more competitive mode where you work your way up the levels trying to score as many points. Freestyle is just that, a freestyle mode in which you can choose whichever level you would like to tackle without worrying about the points. Once you choose your level in either Freestyle or Ladder mode, a transition screen will appear that spells out the level with colored lasers. Once the animation is complete, you'll need to tap the screen to enter the game. While the animated transition screen is a nice touch, it grows old quick. Maybe if the transition into the game was automatic it wouldn't be so bad but as is, it's one aspect of Laser Leisure I can live without. Laser Leisure's game screen is simply laid out. You have a series of reflectors lining the left edge of the screen, your timer is up top and your bonus points are displayed next to the timer. The playing field for Laser Leisure has your laser and targets strategically placed on a grid pattern with walls and other obstacles that you'll need to navigate around. Your target is the colored ball that matches your laser color. Dots of another color are considered obstacles. To place a reflector, just tap and hold on the piece you want to use and drag it onto the playing field. Crosshairs will appear illustrating all the possible reflective angles that particular mirror will generate. Each level has a variety of mirrors to use and they are limited in number. Place them around the playing field to bounce your laser to the target and when your ready to give it a try, tap the laser icon. If you hit the target, you advance. If you miss, you get to retry with a points deduction or quit the game. You begin each level with 100 points and your ending total is the balance of the missed shot deductions and any bonus points you earn by striking bonus items on your way to your target. The only oddity with game play is that once you put a mirror into play, you can't remove it. At best you can move it out of the way but it would be nice to return the mirror back into the unused inventory. While we're talking about oddities, there is a glitch with Laser Leisure that every now and then has the game lock up when you begin a level. The score summary screen appears but you can't tap continue to launch a game. You are able to back out to the main menu but the only solution is to exit and re-launch the game. I had this happen once while advancing to the next game level and several times when starting a game. The graphics and game play of Laser Leisure are simple but completing the level can be frustratingly challenging. The mirrors have to be just right to bounce the laser to the next mirror, eventually striking the target. One little deviation will screw the pooch. All in all, Laser Leisure is a decent game for your Windows Phone that is rather challenging. Unfortunately, the glitches add a level of frustration to the game's challenge and detracts from the enjoyment. Shorten the transition screens, fix the stability issues, and allow for mirrors to be removed and the game improves nicely. The fixes would allow players to concentrate on the challenge of the game. While Laser Leisure has room for improvement, it still is worth a try. 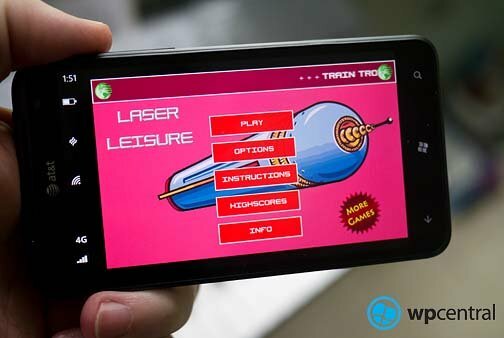 Laser Leisure is a free, ad supported game for your Windows Phone that you can find here at the Windows Phone Marketplace.